The trade-off is that you often have to plan how to manage the contents in your local cache. Over time, the contents in your local cache can become out of date with the server contents. In addition, the local display cache can consume significant disk space on your local computer. You'll need to devise a strategy to manage how your local cache is managed, either layer by layer or for all the contents in your display cache. The steps for each are described here. You can use the ArcMap Options dialog box to view the current display cache size, clear the display cache for all map layers, and set the path for the local cache storage. Click Customize > ArcMap Options on the main menu and then click the Display Cache tab on the ArcMap Options dialog box. When you click the Display Cache tab, you might notice that the cache size counter is spinning up—summing the total display cache size on your local disk. You manage the display cache on the Cache tab on the Layer Properties dialog box for these layer types. Right-click the layer name in the table of contents, click Properties, then click the Cache tab. The three primary tasks you can perform on the Cache tab are described here. 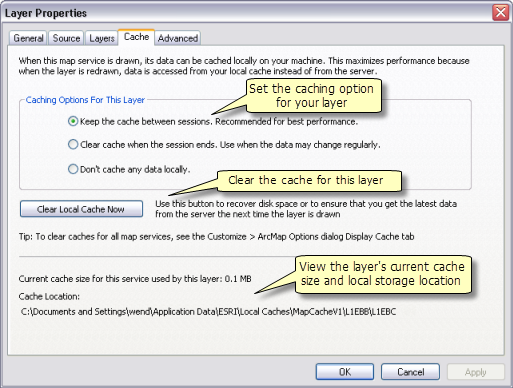 Select the desired option to manage the cache for this layer. Keep the cache between sessions—This is the default setting and offers the best performance. It's recommended for services that are not likely to change. Clear cache when the session ends—This is recommended for services that change periodically. Don't cache any data locally—The map images are written to memory. This ensures presentation of the most up-to-date data available from the service, but it can be slower. This is often useful if you're short on local disk space or the data is dynamic. In some cases, the ArcGIS Server administrator will choose to disable the use of local map caches for a specific map service. In situations where you access such a map service, the Don't cache any data locally choice is toggled on, and you are unable to change this setting. 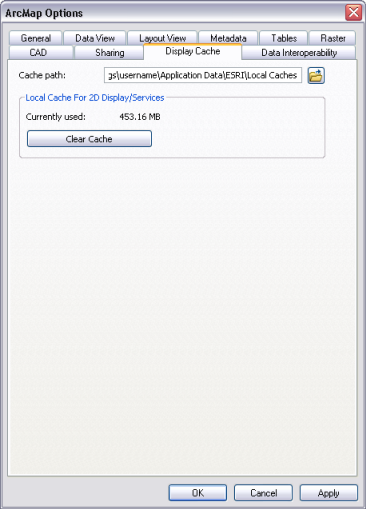 This clears the local display cache for the selected layer, but no other layers in the cache. Clearing the cache for a service affects all the layers in all your maps that reference this service: local caches are stored on a service-by-service basis, and if you have multiple layers that reference a cached map service, they all utilize the same cache of tiles in your Windows temporary folder. The local cache on your machine is always stored in a folder called MapCacheV1, and like all temporary data, this folder is stored under your Windows temporary folder. Inside the MapCacheV1 folder, a separate subfolder is maintained for each cached map service, and this is the last part of the path you see. Caches being used by basemap layers cannot be cleared while in use. To clear the cache, remove the basemap layers from the map. If you normally draw maps for only a few areas, such as your agency's local study area, the cache won't become really large, because the tiles you draw will likely already be in your cache. If you draw maps for many different areas, your cache can grow. Whenever you draw a new area, new tiles are stored in the local cache. The dialog box shows the display cache size of the current layer and the path of the cache location on disk. This helps you monitor its use.